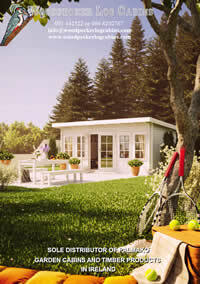 Summerhouses are a great way to extend your life into your garden. You can get the fresh air without being totally outside. In the Spring and Autumn you can be out in you garden but out of the weather, great on cold, wet or windy days. The “summerhouse” cabins have generally large windows on more than on side allowing you to have the feel of outside while being under cover. Although called summerhouses they can be used all year around as a sitting area from early Spring to late Autumn and even in the winter the inside will warm up quite quickly on sunny days.